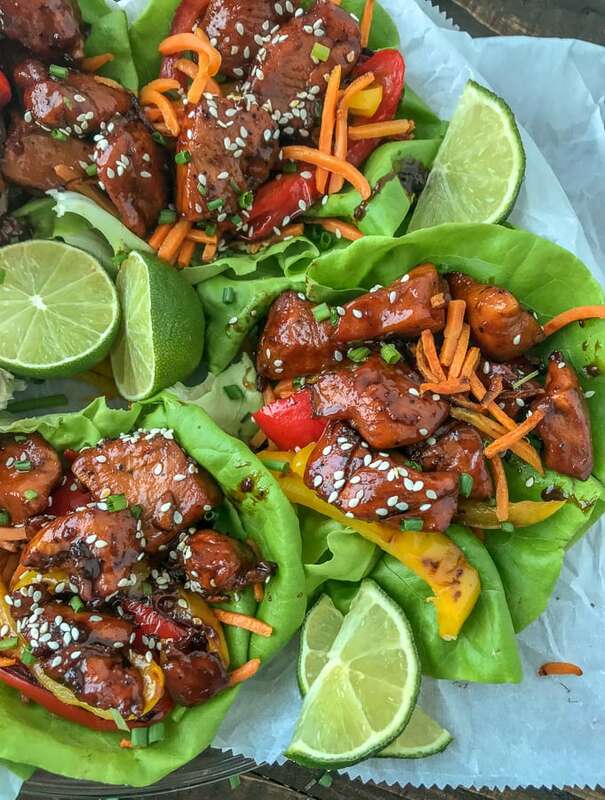 Honey Garlic Chicken Lettuce Wraps – an easy to make sticky, sweet and savory honey garlic sauce that is so delicious – you will be licking your fingers clean! 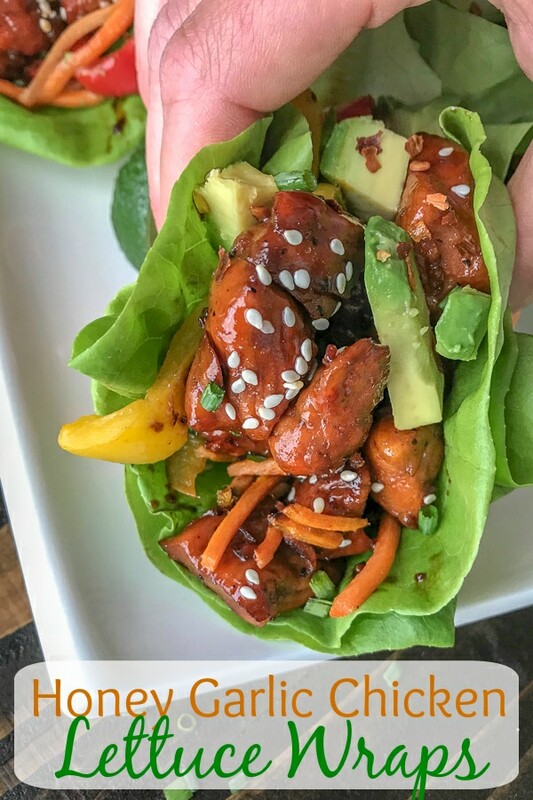 This recipe takes no time to make and is the perfect healthier alternative to takeout. This sauce is going to make your taste buds dance and your tummy grumble the moment you smell it bubbling in your pan. It creates the most delicious sticky sauce that glazes over the chicken perfectly. 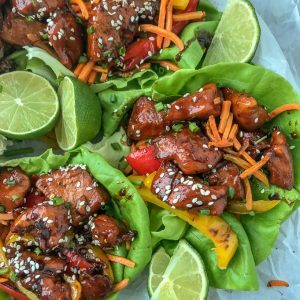 And if you have any leftover sauce – I recommend using it as a dipping sauce for these lettuce wraps! Not only does this sauce come together in minutes, but it also uses staple ingredients that you can find in your fridge and pantry! It is also very simple to make, with barely any time spent prepping. That makes for an ideal meal in my book. Brown rice or Cauliflower rice – find out how to make your own! Thighs, breasts, wings, drumsticks – this recipe is incredible with any option! Chicken thighs are always a favorite in this household because of how tender and flavorful the meat already is. But breasts are also a great option, as it is a leaner choice. Either cut you go with, you won’t be disappointed in the sauce! 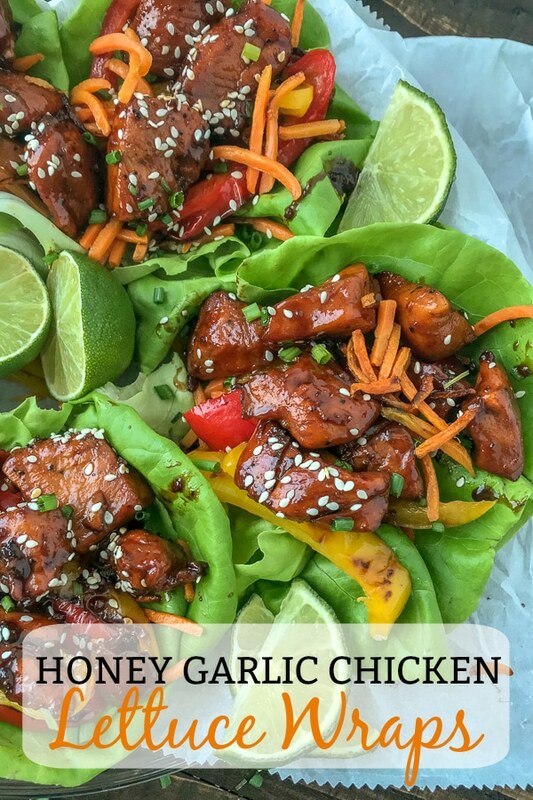 Easy, sticky and sweet Honey Garlic Chicken made with a handful of ingredients that is so delicious - you are going to want to make this again and again! Soon to become a family favorite in your home. Place a nonstick pan or skillet over medium heat with 1 tablespoon of olive oil. Once the pan and oil have heated, add the sliced bell peppers and shredded carrots. Allow to sauté until the bell peppers are fork tender. Remove to a plate, cover, and place the pan back over medium heat. Be sure to leave some of the oil in the pan to cook the chicken breast. If there is no oil left, add 1 additional tablespoon of olive oil. Add the chicken to the pan. Allow to cook 3-4 minutes per side, until it reaches golden brown and is cooked through (165 degrees F). Remove from pan to the same plate with the veggies and re-cover. While the chicken is cooking - combine all ingredients for the sauce into a mixing bowl, stirring to combine. After the chicken has been removed from the pan, add the sauce and increase the heat to medium-high heat. Stir the sauce and allow it to come to a boil for 1-2 minutes. Reduce the heat back to medium and allow it to continue to simmer and cook down for 2-3 minutes. 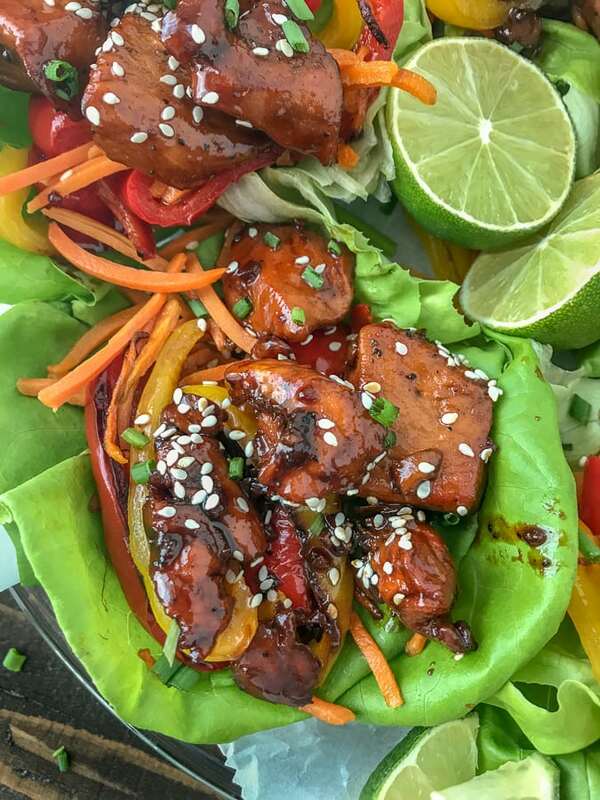 Once the sauce has been reduced by a third and thickened, add the chicken back to the pan to rewarm, tossing to thoroughly coat in the honey garlic sauce. Cook for 1-2 minutes and remove from heat. Divide the chicken into 4 servings, serve with the sautéed carrots and bell peppers, and garnish with sesame seeds. 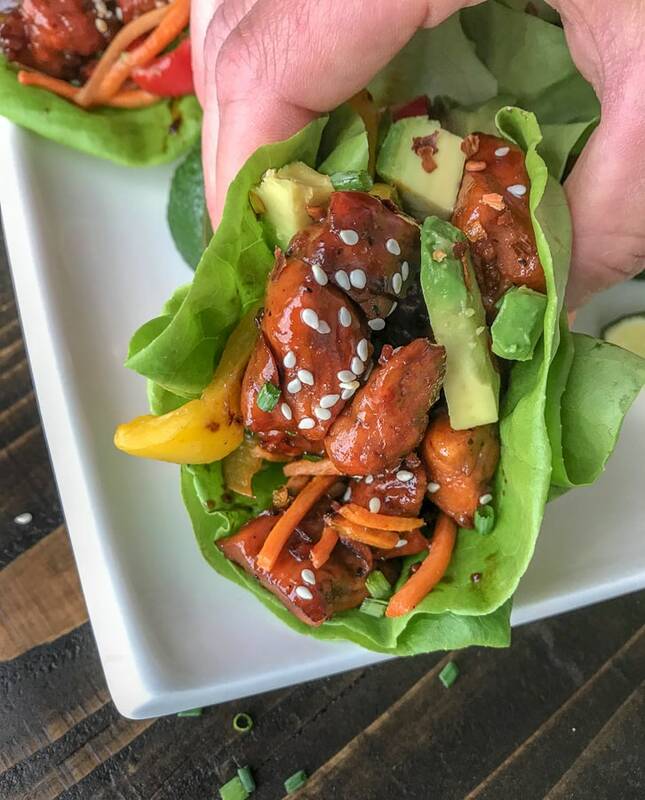 These are great wrapped in Boston Leaf or romaine lettuce for low-carb wraps or served with cauliflower rice, steamed broccoli, or brown rice! Double the recipe for extra sauce, if needed. If not serving in lettuce wraps, but rice, I recommend doubling the sauce recipe. Nutrition is based on 1 serving (of 4) of chicken, sautéed veggies, and lettuce. It does not include avocado, sesame seeds, or additional lime juice (although all delicious add-ins!). If the sautéed peppers and carrots have cooled too much, you can re-add them to the pan with the chicken to re-warm, if desired. I made these last night. Delish!